On a recent trip to see the new MAGIC Center building at Rochester Institute of Technology, we stepped out of a dreary winter day into a high-tech version of the Emerald City in the Land of Oz. "MAGIC" (which stands for Media, Arts, Games, Interaction, and Creativity) is an appropriate name for the new space. It's an academic center, but also a hub where films, video games, and other digital-media dreams are turned into tangible products. And every detail of its design screams innovation, collaboration, and fun — from wide-open modern work spaces filled with funky, brightly colored furniture to the sparkling speckles in the stairwell's concrete floors. 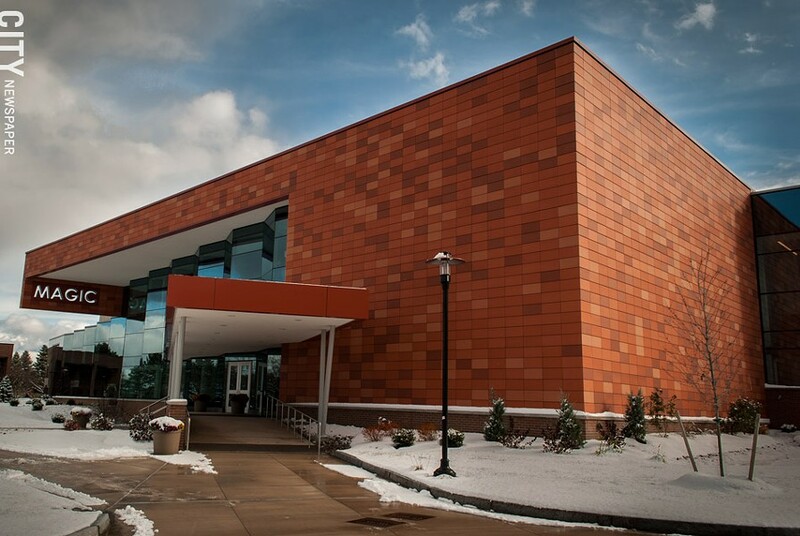 RIT’s new MAGIC Center building provides state-of-the-art amenities for students, faculty, and outside companies. MAGIC is also a university research center and a commercial publishing studio. The center's limited liability company, MAGIC Spell Studios, has published about 55 pieces of media, video games and films among them. MAGIC has existed for about five years already, but with the opening of the new center, students working in film, animation, game development, and other digital media studies got a serious upgrade in their classroom environment and amenities. Relocating their workspaces from dark basements and classrooms in the center of buildings, the center not only provides top-of-the-line technological tools for students and staff, but also serves as a showcase for the work being done there, as it's created. The new 52,000 square-foot facility is outfitted with state-of-the-art tech, private workspaces, and areas for creative collaborations between people from different disciplines. The official grand opening took place in late October, and although the center will gain more amenities over time, it's fully operational now. The center functions as university-wide research center that encourages students and faculty to break down the silos that separate different disciplines, and then work together to make things. Students can also gain real-world experience from production companies that use the center. "We want to offer resources and facilities to people in different programs here at RIT," says MAGIC Digital Games Hub Coordinator Rob Mostyn. These programs include Film and Animation and Game Design and Development, but the center's directors also want people from other disciplines — English majors, for instance — to use the space and work on projects. "Basically," says Mostyn, "we have the sandbox. We want everyone to come play in it, build cool things." 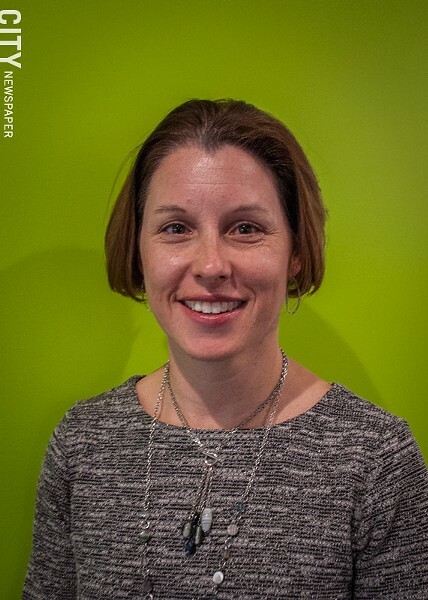 Creative collisions happen when you put people from different disciplines together in a space with lots of cool toys, says the center's assistant director, Jennifer Hinton. The new building offers resources and facilities for the Rochester region that formerly could be found only in Toronto or New York City. The facilities are available to outside companies to use for filming and for post-production sound mixing, for example. "So the fact that we can offer them not only to students and faculty but also to the community is a huge asset," Mostyn says. "And we hope that it draws people in." Diverging from the "brick city" look of most of the other buildings on the Henrietta campus, the center's front facade has tall glass windows that give it a futuristic look and that stress that the center functions as an open showcase of the work going on inside. The front entrance opens into a soaring hall alive with activity. Students converse in lounge areas, and flat screens lining the walls offer information about the center. 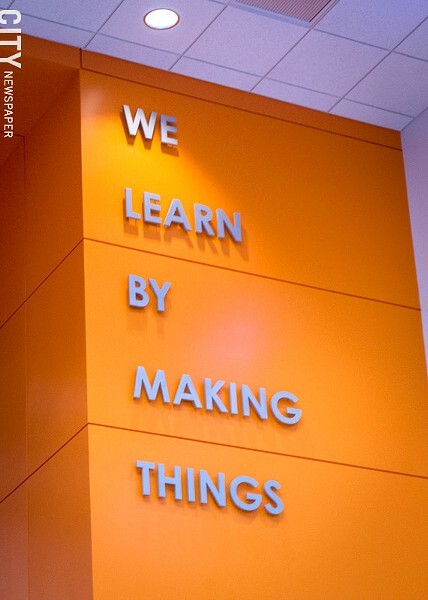 Across the room, a two-story orange wall bears the words: "WE LEARN BY MAKING THINGS," underscoring the center's emphasis on experiential education. On the lower floor of the center is a 180-seat theater, which has 4K laser projection (all of the digital displays in the building are 4K, which is a high-resolution version of a system that projects changing laser beams to produce moving images) and Dolby ATMOS surround-sound system. There are 58 speakers, which provide intense sound, Hinton says. "Like, feel-it-in-your-feet amazing." Every space in the center is designed to be multi-purpose, multi-functional, Hinton says. 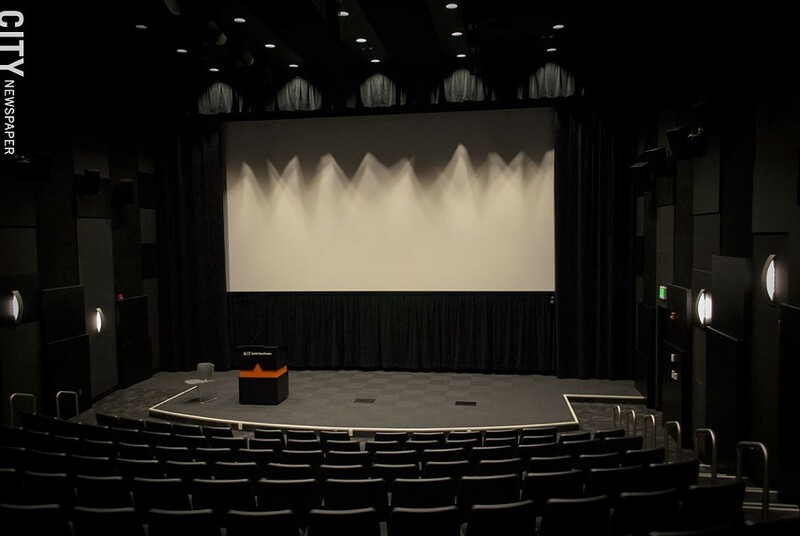 "So while we expect that the School of Film and Animation will be the primary users of this space, to show their screenings, we will use it in other ways as well." These other uses include screenings by commercial productions. A small demo lounge is intended to be a more informal conference room space "where companies we're working with might pitch ideas to us," Hinton says, "or where students might be pitching their ideas to folks." There are also two 40-seat, theater-like classrooms, one for color correction and another for audio mixing. These workspaces "are intended to be post-production facilities as well as well as teaching and research spaces," Hinton says. They'll be used primarily by students and faculty, she says, "but will also be available as a post-production house for folks who are perhaps utilizing the soundstage." Just past the theaters is a glass-walled server room, which you hear before you see. Tall rows of machines that serve computers throughout the building provide a steady buzz as a constellation of lights flickers. Toward the rear of the building is a 7,000 square-foot sound stage: "This is the big room," Mostyn says of the cavernous area. It has an operable lighting grid, storage, a control room, and a loading dock not visible from the front of the building. 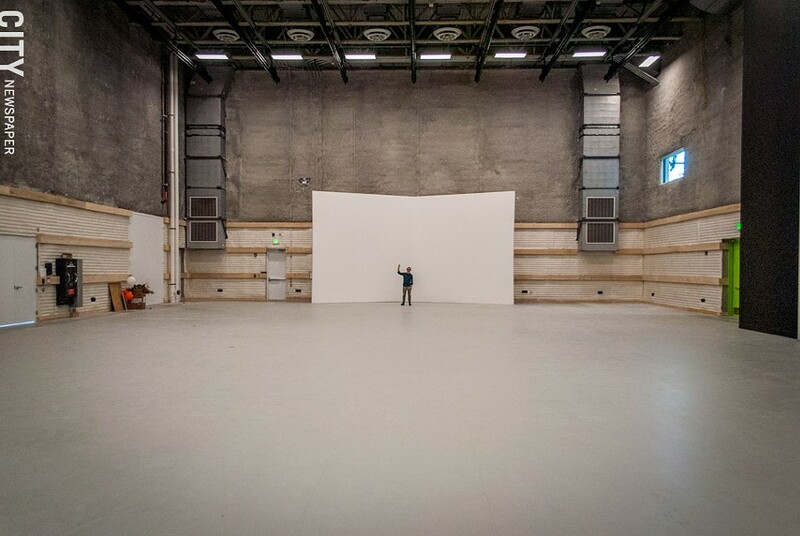 And areas of the space are equipped for use with green screen and motion capture technology. Down the hall there's a green room, shower and makeup rooms, and two offices that can be used by producers and directors. The space is intended for use by students but also by outside production companies, Hinton says. Two commercials have already been shot there, both by Rochester-based company Optic Sky Productions, which was founded by RIT alum Aaron Gordon, a graduate of RIT's Student Incubator Initiative. (The initiative is an intensive program designed to help students who want to start a business or commercialize their creations). "They're helping us to sort of road test the space right now and figure out: How do we rent this out, what do we need to do to make this a viable solution for folks?" Hinton says. And for Gordon, it's a great solution, she says, "because if he was not shooting here, he'd be going to New York City." "If we have other productions here as well, they can perhaps utilize our student crew — students who are trained in this discipline and are looking for professional experience," Hinton says. Upstairs, there's an immediate contrast between the hush of the lower studios and the buoyant, social buzz of productivity of the Innovation Suite. The central, wide-open student co-working space is surrounded by glass-walled offices for MAGIC staff and academic faculty, so the students have access to mentoring support. The space is full of computer stations with industry-standard software, cheerful colors, and funky-shaped furniture, and there's animated chatter as students and staff work together. It feels more like your coolest friend's loft apartment than a classroom or an office. "We have tons of glass, because we want to be nosy," Mostyn says. "We want to walk by people and be like: 'What are you doing? What's that? Let's work on something.' Or just know what's going on. Often we say a lot of the cool things are happening in basements or in the center of buildings on campus, but we want to show it off." In the upper level of the MAGIC Center, students collaborate with RIT faculty and MAGIC staff in the Innovation Suite. Sounds from a ukulele float through the open door of one office, and many of the staff's shelves are lined with as many toys as books. "This is the heart of the building," Hinton says. "It's where students work on projects that they brought to us. They went through pitching their ideas, their business plans, and were vetted by our team, and we selected three to be in residence with us this fall, really giving them the opportunity to flesh out what it is they want to make." The work that's being done in the Innovation Suite varies, depending on the current digital media projects being produced. Students working there benefit from the school's student "co-up" program. It functions like a co-op, but the students are paid to work on their media projects, some of which end up published through MAGIC Spell Studios. One of the current co-up projects is by a student-formed company called Aesthetician Labs, which has created a game called "Crazy Platez." A mobile game about delivering plates of Rochester's most notorious cuisine through downtown Rochester, it's the company's love letter to Rochester. The game earned the team first place in the student developer category in the 2018 New York State Game Dev Challenge, and it'll be released December 5 on iOS and Android. Aesthetician Labs is also developing an arcade cabinet game for it, which will be housed at the MAGIC Center. 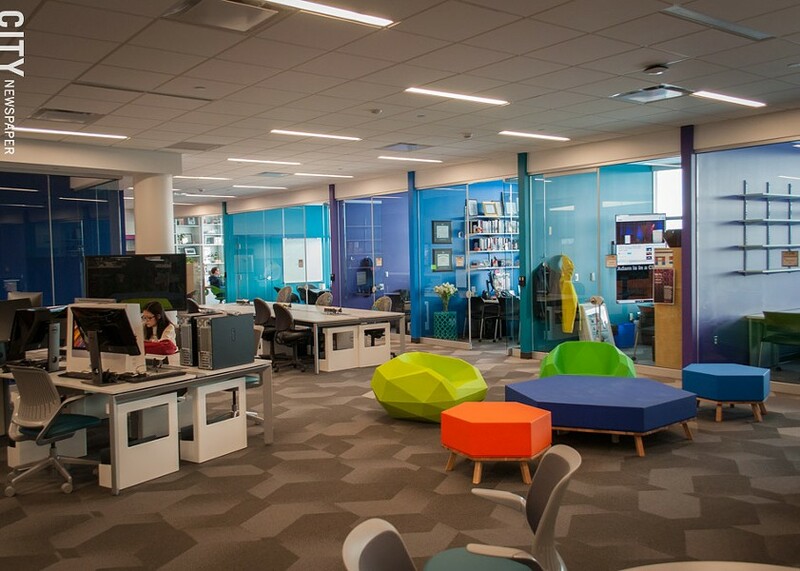 This space isn't exactly a classroom; it's an area set aside for students and faculty to work independently, together on collaborative projects, or for those working on different projects to bounce ideas off one another. "They're all working together and making each other better," Hinton says. "And they're making the projects that each of them are working on better. To be able to have a film student take a look at a game student's trailer, and say, 'Let me show you how we can make this a little better,' you can really leverage the strengths of each of those disciplines." Another group of students working in the space is creating a web video series." Since they began work on the project, the students realized that their initial idea wasn't viable. Learning from that, they're now on their third iteration of the project, and Hinton says she thinks they've hit their stride. "I think their story is all about failing fast and failing often, and learning from those mistakes and getting up and trying again," she says. And the students benefited from the co-up safety net that the school provides. They receive academic credit as well as funding, which helped give them the time and space to troubleshoot their way to success. 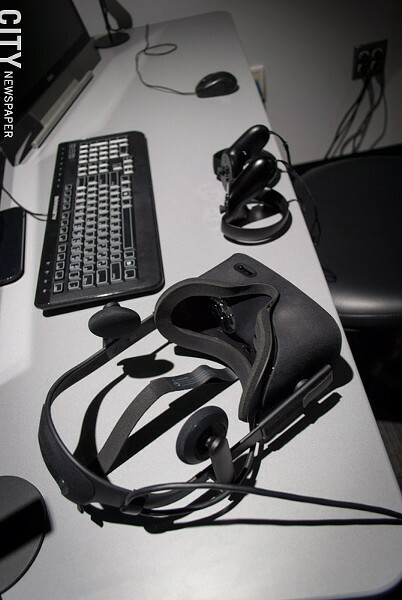 MAGIC Center's upper level also has multimedia labs, and a virtual reality (VR) and augmented reality (AR) lab. (Augmented reality is technology that incorporates elements of the real world with elements of virtual reality). One of the four rooms dedicated to stop-motion animation projects is the current workspace of Allison Zelle, a graduate student in the School of Film and Animation. 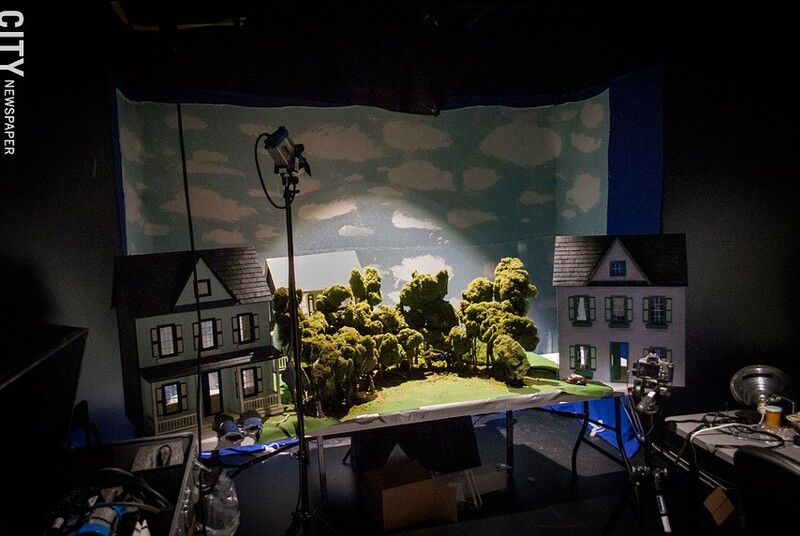 Tables in the dark-walled space hold her in-progress thesis project, which includes a couple of miniature houses separated by a copse of trees, with a cloud-filled sky as a backdrop. There's such attention to detail that from several feet away, it seems like you've got a bird's eye view on a genuine little world. One of four rooms dedicated to stop motion animation currently houses a graduate student’s thesis project. Zelle has possession of the space for the full semester. Formerly, the school only offered one room that students could sign out for a week or two at a time. The VR and AR lab gets heavy use from students, and also from groups such as Frameless Labs, a consortium of faculty researchers from several different RIT colleges. Frameless Labs uses VR and AR for a wide variety of projects. Its "Farewell to Dawn" is an augmented reality theatrical dance performance — with real performers in different physical spaces interacting on a virtual stage — co-created by RIT and the Nazareth College Department of Theatre and Dance. The group also uses the technology to create games such as "Ego and the Dream Work," an interactive virtual reality game. In the real world, people with jobs producing digital media work collaboratively with people across different disciplines. "It's really only within universities that disciplines exist within silos," says Hinton. "We're trying to create an environment for our students to have practical experience that will resemble, mirror the experience they'll have creating digital media post-college." One of the MAGIC Center's responsibilities is to grow the programs in the School of Film and Animation and Game Design and Development, two of RIT's most popular programs. "We've been turning away qualified students because we just simply didn't have the resources or the space to support them," Hinton says. With the addition of the MAGIC Center facilities, RIT expects to increase its enrollment by 200 students. Beyond producing media projects, the center is interested in encouraging entrepreneurship, working with students who want to develop a business around their projects. The center also provides work space for organizations and companies unrelated to the school. These collaborative partner suites give MAGIC the opportunity to partner with outside companies interested in doing business in Rochester or having a satellite office here, says Hinton. The spaces are rented to companies for free, but they're intended to be symbiotic opportunities for the companies, the university, and the students. Forbes Media is in residence in one of the two collaborative partner suites. The Rochester satellite of the New York City-based company has been partnering with MAGIC since 2016, when RIT graduate Joseph Pietruch moved back to Rochester from New York City and was working remotely for Forbes out of his apartment. He reached out to MAGIC, and a collaboration was struck. In the summer of 2017, MAGIC began hosting a remote development team of Forbes employees and RIT co-op students. That's led to students contributing to the development and testing of a new web platform called "Bertie" that Forbes is rolling out for its writers to use in creating articles for its website, Hinton says. Forbes has since hired 11 RIT students. MAGIC is in talks with potential tenants for the second collaborative partner suite. Unlike the glass-walled transparency of the first suite, the second space is meant for people who can't do their work out in the open due to nondisclosure agreements, Hinton says. 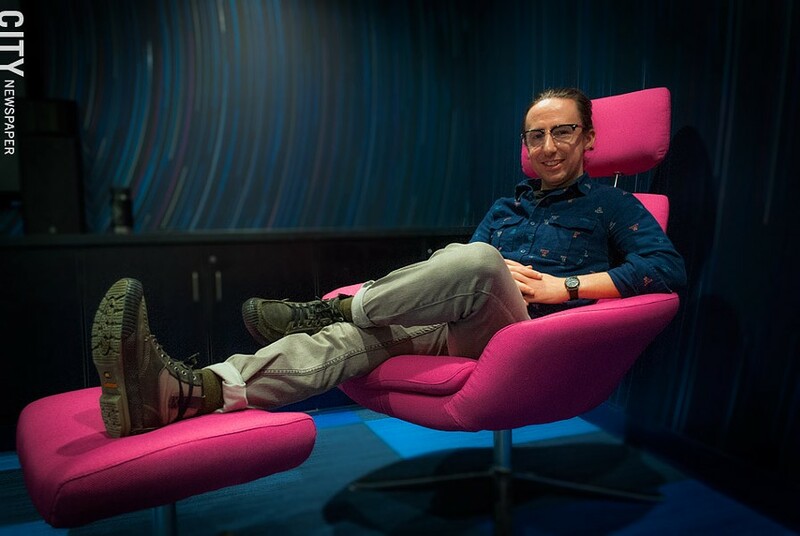 As the center's directors grow the Film and Animation and Game Design and Development programs, they anticipate hiring additional faculty. All of this costs money. Half of the center's funding up to this point came from Empire State Development grants and half from private donors Dell, Cisco, and the Wegman Family Foundation. RIT is currently conducting a $1 billion capital campaign, which will include funding for the center's continued evolution. "I think if we say we're 'done' we're not doing what we should be," Hinton says. Mostyn says he believes there'll will be more and more collaborative projects between people from different disciplines and interests. "With distribution becoming easier and more accessible, I also believe we're seeing more digital media focused on niche interests, underrepresented populations, and unexplored games," he says. "This is where innovation happens," Mostyn says. The obvious "hot and hyped" trends in digital media, he says, are virtual reality and augmented reality. But other interesting trends are the growing indie developer community and doing client work. "Making a game with a small team — or solo — is easier than it's ever been," he says, "but that doesn't mean the money is always there." Like many other kinds of artists, small teams and studios are taking on commissioned work as a way to fund their own projects. Mostyn also says he thinks we'll see video games "sneaking their way into our daily lives more often" — not necessarily as games to play, but as learning tools. And in the near future, he says, the general public will regard games as an art form. Games are gaining on media "that 'everyone needs to see' — like movies or music — and that will eventually break down the stigma that 'playing games' currently has," he says.